Glowing rocks! Millions of dollars in gems and precious minerals on display! Cold water down the back of your neck. All of this and more can be part of your day if you visit The Sterling Hill Mining Museum. The kids and I went last week, and it was a great way to beat the heat and learn a little about New Jersey History and precious minerals. Plus: glowing rocks! The museum is about a 40 minute drive from Madison, but we had two kids in camp at the Kubert School of Art (really cool, I'll save it for a future post) in Dover, which got us about halfway there already. The entrance is through a yard with lots of cool mining tools and train cars from when the mine was still in use. It closed for business as mining costs rose and the price of the zinc they were getting was decreasing in the 1990s. There is a tour daily at 1 pm in the summer, and we were with about 50 people as well as a camp group, so it's not a lonely place. After lunch in the Miner's Lunchbox Snack Bar (where you can get a traditional miner's lunch called a pastie --rhymes with nasty but is tasty and has beef and potatoes wrapped in dough, like an empanada or calzone) we set off for the tour. We began in the Change House, which is where the Miners would keep their things in lockers and could hang up their wet work gear in metal crates and hangers suspended from the high ceiling. The hangers and crates are still aloft today, and their are some lockers, but the rest of the space is filled with geologic wonders. A scavenger hunt is a fun way to explore most areas of the display. We found real and fool's gold, a magnetic rock, a rock that could be melted down to make 5,00 soda cans, among other things. The shower area has been retrofitted with display cases containing ore specimens from around the world. There is also a small curtained off area with rocks that glow in UltaViolet light, a preview of an area of the mine we would see later. After the Change house, we headed into the mine. There is a large pipe coming out of the mountainside next to the door where we entered. Our tour guide told us that this had been used as a pump to keep the water out of the lower levels of the mine. Now it is not in use, so we would only be seeing the top level of the mine as all the rest was under water. It seems that water seeps through the rock when it rains and settles inside the mining areas. It had just rained when we visited, so there was plenty of drippy evidence that this happened. Inside the mine, which is always 56 degrees fahrenheit, there are about five areas where mannequins are set up as miners to show how the operation worked. There was a child sized miner holding up the door, an example of what a sick miner's child, sent in to substitute for dad, might have had to do. This was before child labor laws were enacted of course. A kids' job? Keep the air doors open for proper air circulation. The kids weren't sure if that would be better or worse than Physical Education at school. Other areas included the elevator system that brought worker's down the mine's 25 levels, what the widow maker drill (it made dust that miners breathed in before the advent of masks and gave them a statistical 35 year life expectancy) the lamp room where miners picked up their helmets-with-lights, and a blast demo in which sound effects mimicked how loud dynamite blasts were while the tour guide briefly turned off the lights. Then there was the rainbow tunnel, which was part 1 of why we came here. 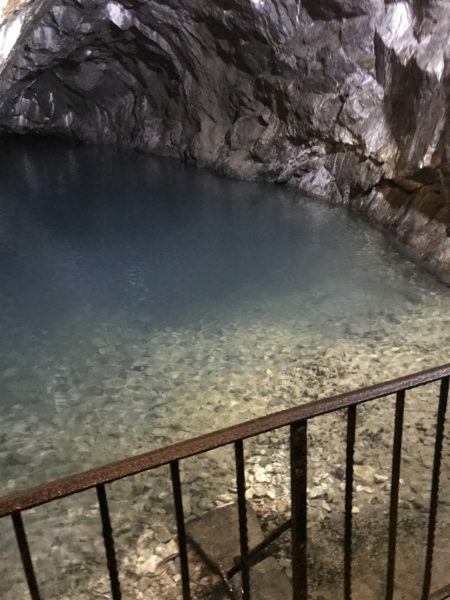 Within the mine, there is an area that features several phosophorescent rocks. 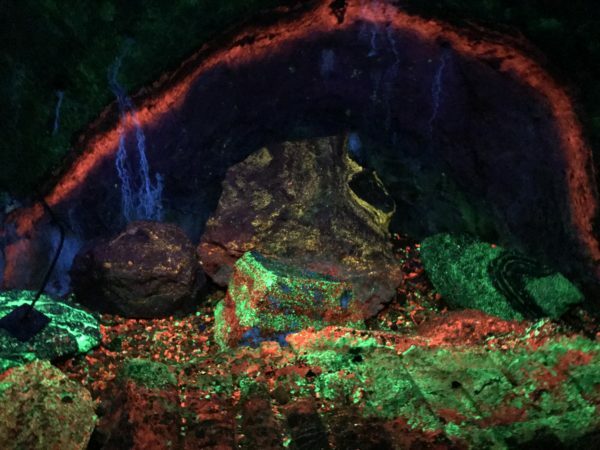 We were able to see the bright streaks illuminated by UV light as they appeared before they were mined. Then the tour guide turned off all of the lights and some of the minerals even glowed green in the dark. Part two of why we came was the warren museum of florescence, also on the tour. 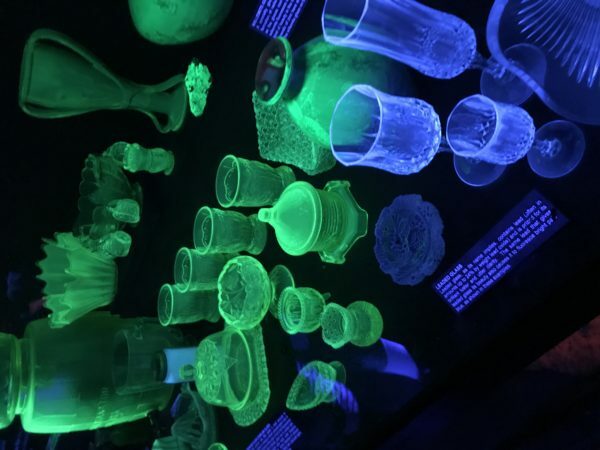 It is four rooms filled with flourescent mineral specimens, fluorescent art and examples of fluorescence used in everyday objects (remember when flip phones' keys glowed a yellow green: that's fluorscence!) The whole area is lit with fluorescent light to best appreciate what is on display. That finished our tour, and we were glowing with knowledge of all these geologic wonders! Or maybe it was the Pasties. Just kidding! The museum is also host to a gift shop with lots of gems for sale (almost everything from Steven University, if you or someone you know is a fan). They also host monthly viewing sessions at the Ellis Astronomical Observatory on the grounds. And, every so often, they'll let you do some mineral collecting! Our takeaways are that miners had a tough life but the mine is something amazing and unique to see. You can find out more about the Sterling Hill Mining Museum Here.